Spring 2019 Festive Board | Austin Lodge #12 A.F. & A.M.
Our menu will include classic a Irish menu including Corned Beef and Cabbage, Black eyed peas, and additional sides and dessert. Vegan menu will also be available. Bio: Timothy Hogan is an author and lecturer within the Western Mystery school tradition. He is a Past Master within several different spiritual traditions, including many bodies in Freemasonry (AF&AM) and of Rosicrucian lineages. He is a Grand Master for multiple Knight Templar lineages. Timothy Hogan has lectured all over the world in both public and private venues, including as a guest speaker at Universities and US Embassies, and has appeared on numerous television programs world wide, as well as multiple pod cast and radio interviews. He is author of The Alchemical Keys to Masonic Ritual; The 32 Secret Paths of Solomon; Revelation of the Holy Grail (written under the pen name of Chevalier Emerys); Entering the Chain of Union; The Way of the Templar; Novo Clavis Esoterika; and he is author of The Elements of the Elements. 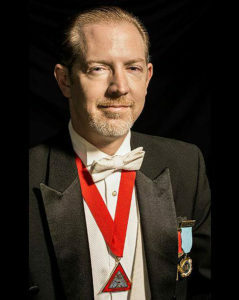 Timothy Hogan has written for several periodicals over the last decade, including L'Initiation, Ariadne's Web, Livings Stones Magazine, the New Equinox Journal, The Scottish Rite Journal,and Heredom. Timothy Hogan's books have been translated into Spanish and German. Timothy Hogan is likewise known for his Track II diplomatic meetings with both profane and spiritual world leaders. Bro. Hogan will be presenting "The Elements of the Elements" A masonic perspective on the five classical elements of earth, water, air, fire, ether, and how they have been utilized in myths, sacred texts, alchemy, Jungian Archetypes, sacred architecture, and religious rituals around the world. An examination of how they relate to the physical constitution of the human body, and to the states of consciousness identification is also presented.